The key to my happiness with the digital media collection I am continuing to amass, particularly digital audio, is to avoid being trapped by vendor lock-in. While many Mac users stick with some version of the iPod (and I can't blame them - as I mentioned previously I have a 20 GB fourth generation iPod), the iPod is not the only digital audio player on the market. Yet the iPod is a safe bet when checking for Mac compatibility and is one of the nicer digital audio players, while still remaining competitively priced. Easy to use, sleek in design, and every iPod I have played with has felt comfortable and well constructed in my hands. The market leader has earned its position on the quality of the product and continues to set a high mark for competitor's to try and surpass. Even still, the iPod doesn't have all the features I would prefer out of a player. Primarily, those features absent from Apple's device are the lack for support of open audio formats such as the lossless FLAC or lossy Ogg Vorbis and not providing a way to add music without being forced to launch an application. The official method is to use iTunes to sync media to the iPod, although there are other applications providing iPod support. Clearly, I am not an expert in the matters of digital music licensing terms, and I apologize in advance for any mistake I may make when discussing these concepts. It is my understanding that developing decoders or encoders for MP3 playback in addition to distribution of MP3 content requires paying a licensing fee. In contrast, content distributed in AAC, the logical improvement to the MP3 standard and the iTune's default encoding format, is free from such licensing concerns for content distribution, but there is still the fee for developing encoders and decoders. By using FLAC and Ogg Vorbis for my lossless and lossy needs respectively, I hope to avoid the whole issue of what platforms can legally ship with decoders and encoders for those other patent encumbered formats. The unfortunate bugaboo is the surprising lack of support for these free formats in mainstream software and hardware, such as iTunes and the iPod. I would have thought Apple could have enhanced QuickTime to support Ogg Vorbis and FLAC, which would allow iTunes and other applications tapping into QuickTime to also support these open formats. Once QuickTime support was enabled, I'm sure iPod support would follow, at least in the mythical fairy tale realm I inhabit. If I had to guess, Apple's rationale for not supporting Ogg or FLAC lies is their desire to infect iTunes Store music with DRM, consequently ensuring only the devices licensed for FairPlay can function in the iTS ecosystem. Happily for Apple, the iPod is the primary device enabled with FairPlay compatibility. Openly licensed formats such as FLAC and Ogg Vorbis cannot be so infected without violating their license. For Apple, supporting an industry standard like AAC, which so happens to be able to be locked down with DRM, probably makes better business sense. Similarly, while Apple's competitive lossless format, Apple Lossless, has not currently seen any DRM implementation, there is conjecture that DRM can be similarly implemented as in the FairPlay AAC files. Enough mumbo jumbo already. I'll get to the meat of the matter, which is my experience thus far with my open box iAudio G3 1 GB digital audio player. I purchased the iAudio G3 via the COWON eBay store on account of the PayPal "spend $50 or more and get $20 back" promotion (more on this later). The total price came to $73.49 in American dollars. Shipping was prompt. I did a "buy it now" on Sunday, 2006.12.03, and it arrived Thursday, 2006.12.07. Estimated delivery was not until Monday, 2006.12.11, so imagine my surprise when the package was sitting on my doorstep on Thursday. The package was well protected, and the G3 with included accessories came in the original box. The iAudio G3 comes with a plastic carrying case, two plastic screen protector sheets, a neck cord, a mini USB to USB cable, a line-in cable, earphones, an AA battery, a software CD (not Mac or Linux compatible), and a thick user manual almost 300 pages long - but really own containing 27 pages of information repeated in nine different languages (the PDF manual from the COWON website may be a little more informative, as it is 38 pages in length, although I have only given a cursory examination of either manual). My only nitpick with the delivery process was that the AA battery was missing from the packaging. Customer support let me know they would ship me out a replacement AA battery, but I may simply ask for the reimbursement of the expenditure it would take to get the AA battery to me. I'm thinking a $1 refund would be sufficient. I have not received a reply to the latter request, but I'll update when this minor issue is resolved. I'm quite fond of the player, and I don't want to start out as a negative Nelly, but there has been a potentially significant change which is not yet reflected in the various information available on the Web about iAudio products. Contrary to the text on the G3's packaging, COWON's eBay store, COWON's JetMall web store, and every review and piece of reseller information I have read, the iAudio G3 is no longer compatible with any version of the classic Mac OS. In fact, every iAudio device now has newer firmware which only works with Mac OS X - in addition to Windows and Linux support, of course. There is talk of flashing the firmware back to an older version that does support the classic Mac OS. I believe firmware 1.51 is the last version with support for the classic Mac OS, but not only is a Windows computer needed for the task, I think you may have to go back to an even older firmware revision first and then upgrade to 1.51. Either way, it's not really easy or even possible if you're an exclusive Mac user. The actual product pages on the COWON America website do reflect the newest system requirements, but I somehow missed this tidbit in the barrage of old information. Lack of Mac OS 9 support is not a deal breaker, but I have to admit I was a little disheartened. An interesting note tying into the music loading experience. The nice thing about the G3 - and possibly most other flash players - is that the absence of a battery doesn't render the player useless. While waiting for a set of rechargeable AA batteries to finish charging, I decided to connect the player to my iMac with the included USB cable. Sans battery, the little G3 player gets its power over USB, and transferring songs to and from the player doesn't take very long, even over my anemic USB 1.1 ports. 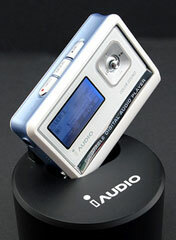 The iAudio G3 has support for USB 2.0. Transfer speeds should improve accordingly on computers equipped with the faster bus. The G3 is not functional over USB except for supporting the transfer of files, and while connected it acts like any other USB mass storage device. There is a hinged port cover on the left side of the player that keeps the line-in and USB ports safe from dust. Although the little cover doesn't have the most robust feel, this component feels strong enough to withstand repeated (but careful) use. In fact, the whole device gives me a similar sensation. While the G3 is mostly plastic with a few metal pieces, everything feels solid enough to withstand average careful use. While an iPod features very little in the way of moving parts, the iAudio G3 has the aforementioned port cover, the battery compartment door and hold button in the rear, the lever on the right side of the face, and the three top buttons. The iAudio G3 has a nice enough appearance, given the design considerations and inherent compromises inherent with finding space for a AA battery. The shape is a chunky, yet slightly rounded rectangular appearance. The whole unit about the size of a small box of matches. The bottom of the player is the roundest part of the case, which is understandable, as that is where the cylinder shape of a AA battery will sit. My G3 is the Sky White color, white in the front and rear, light blue on the sides, each accompanied with silver highlights. While clearly not the sexiest player, I find the player charming, with a pleasant, if simple, exterior. It's not iPod shuffle elemental - after all, the G3 has to accommodate an LCD screen and AA battery - but everything is functional and easy to control. I'm not sure how the various components will hold up with long term use. I'm eyeing the port cover door, battery cover door, and navigation lever, but the player feels tightly constructed while all flaps are closed. The potential liabilities of the design are exacerbated by the plastic carrying case having an aggressively tight fit when removing and inserting the G3. The little toggle lever on the face sticks up high enough to catch on the plastic if not careful when sliding the case on or off. The easy fix to give the current case some wiggle room is to cut out the plastic covering the top buttons on the carrying case with an X-acto knife. While the case still requires a little effort to get on and off, it's much easier now with a side benefit that the navigation buttons on the top are now unobstructed and easier to click while the G3 is in the case. I should note that once the carrying case is on the G3, the lever is now almost flush with the case, so the worry of catching the lever on something is much reduced. Another option is to simply affix one of the included screen protectors and forego the carrying case altogether. While the lever may still catch on something while stowed away, the LCD will have a reduced chance of accumulating scratches while the screen protector is affixed. Once a AA battery is installed and the G3 powered on (press the top right Play/Pause button to turn it on and hold the same button to turn the G3 off) the basic navigational functions quickly become clear, except for the most obvious - actually navigating the audio hierarchy. To reach the audio navigation menu (or Navigator, in iAudio speak), the lever needs to be held down for a couple seconds - one click will simply bring up the Menu, the home for the G3's system settings. The easy fix for those users who desire quick access to the Navigator instead of the Menu, you can switch the behavior under Menu -> General -> Menu Button for one lever click to bring up the Navigator and a held down click will then bring up the Menu. Overall navigation is not iPod scrollwheel easy, but interacting with the G3 is consistent once the basics are understood. The most basic function of the lever is to control quick navigation by toggling right or left to get to the next or previous folder, song, or station. When in MP3 mode (the mode for playing any digital audio files, not just MP3), holding down the lever either right or left will fast forward or rewind the audio file. In the same mode, pressing the lever up or down will adjust the volume higher or lower. When in the Navigator or any menu granting a list of files or folders, a right or left toggle will dig you deeper into the file/folder hierarchy or push you back a layer. An up or down toggle when in the Navigator or any menu granting a list of files or folders, will scroll up or down the list. Pressing the lever inward will bring up a submenu consisting of relevant actions to the selected entry. In a menu where the lever is navigating a hierarchal structure (Navigator or Menu), pressing the top left Record button will exit back to the current mode without saving any relevant changes, a.k.a. the cancel button. Pressing the right Play/Pause button will either play the selected audio file or exit back to the current mode while saving any relevant changes, a.k.a. the okay button. Pressing the top middle Mode button will bring up four modes: MP3 Player, FM Radio, Voice Recorder, and Line-in Recorder, with the Record and Play/Pause buttons continuing to act as cancel or okay buttons. Pressing the lever inward also acts as an okay command to the selection. If you press the Mode button while in the Navigator, three differing options appear: Music Files, Dynamic Playlist, and Bookmarks. Selecting Music Files allows you to dig into the entire collection of audio files stored on the G3. Dynamic Playlist is a listing of all the files tagged for inclusion in a list similar to the On-The-Go option found on the iPod, the difference between the two being that the G3 only allows one Dynamic Playlist at a time. The Bookmarks option displays a list of all the files tagged with a bookmark. By tagging a file with a bookmark, the G3 can resume playback of a desired file from an exact point at some time in the future - a great way of taking a break from a podcast without fumbling for the exact spot to resume after listening to other music. The iAudio G3 brings a nice selection of features besides just playing back the various audio formats. The FM tuner has been surprisingly handy for those moments when I want a weather or traffic update or to listen to the local ESPN radio affiliate. The FM tuner also allows for recording broadcasts as well as scheduled recordings, although I haven't yet had much use for either feature. Voice recording is possible with the built-in mic. Adding an external mic isn't possible, because the line-in jack doesn't provide any power, but an external powered mic should work fine. I have used the voice recorder to make a few memos to myself, and although not great sounding with the default settings, a little tweaking seemed to improve things. 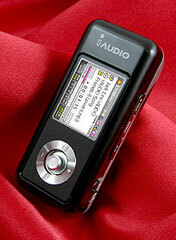 The G3 can also record audio over the line-in port from a variety of sources, but again I have not used this feature. The maximum encoding rate for the FM, voice, and line-in recording is 128 kbps MP3. Lower bit rate MP3 and WAV setting are also available. The last interesting extra is COWON's support across their digital audio player lineup with preloaded support of Podcast Ready's myPodder software. Not having a chance to actually test this software, I have no idea how good a feature this may prove. Having yet another way to easily streamline subscribing to and managing podcasts would be nice. I don't use iTunes at all for my podcast listening. Since I spend at least half the time, if not more, listening to a podcast from my computer, I simply subscribe to the RSS feeds for my favorite podcasts from the built-in Opera RSS reader. Being on dialup, I prefer to manually download those episodes I want and then delete the link from the RSS feed when I'm done. Not a great system, but easy enough when managing only a handful of podcasts, and my browser is always open, while iTunes is not. Perhaps the myPodder support will prove a better system. How do I like the iAudio G3? Quite a bit, actually. While the G3 doesn't support my much desired FLAC, it does fine with MP3 (including VBR), WMA, protected WMA, Ogg Vorbis, and WAV. I don't have any WMA files to test, and although protected WMA will require a Windows computer to load onto the G3, I see no reason why dragging and dropping WMA audio files from a Mac or Linux box wouldn't work just fine. Sound quality is quite nice and perfectly acceptable to my average ears. Even when plugged into an external source, such as a stereo or small speaker set, I found the sound to be on par with my 4G iPod - perhaps better after fiddling with the audio enhancements and equalizer settings. Once I changed the default setting for invoking the Navigator, navigation went from solid to quite good. Ergonomics of the controls are comfortable, but not as streamlined as something like the iPod. Then again, the G3's increased feature set over the iPod certainly calls for some added complexity. Music navigation doesn't have automatic presets for artist, song, album, or any other ID3 tag shortcut. Instead it sticks to order of files/folder downloaded (ascertained from a time stamp), file name, or file time. Adding music is as easy as connecting the G3 to my iMac and then dragging and dropping lists of files or folder to the player. The quirk with the older iAudio players is their support for a maximum of 50 folders and 650 files. For 1 GB of music from my collection, folders could be more of a problem, since the G3 uses six folders by default. My solution to this issue is to make a folder on my the G3 via the OS X Finder for each "playlist" I desire. I can manually fill the folders, use some AppleScript shortcuts, or simply use iTunes outstanding organizational ability to make smart playlists. I would like to dig deeper into the playlist creation tools I use, but I figure things can wait until my next article to detail my iTunes Smart Playlist method and the AppleScript method. The iTunes solution may seem odd coming from someone such as myself, who has previously decried being forced to use a big hulking application like iTunes just to load music onto a digital audio player. However, my reasoning is really not so strange. The G3 gives me the ability to have choice, and the flexibility found within this choice is much appreciated. When I download a new album from eMusic, I know I want to listen to the whole album, and being able to plug the G3 into my iMac and drag and drop the new folder to the player is a much simpler solution than launching iTunes. Being able to use iTunes and its smart playlist ability is also a welcome choice when I have specific requirements to meet with synching music to my iAudio G3. The possibility of using AppleScript to script a shortcut will also be wonderful and potentially much more flexible than even iTune's smart playlist. Let me briefly touch on battery life. COWON rates the iAudio G3 for 50 hours from a single AA battery. In several tests with different MP3, WAV, and/or Ogg Vorbis Files, with the various sound enhancements turned on and off, and fiddling with various setting and navigation elements, I could get 18-21 hours on one 2300 mAh NiMH AA battery. Alkaline batteries reportedly have better battery life, and I know at least one user who has gotten 34 hours from a single 2500 mAh NiMH AA battery while solely playing MP3 files. The unit is rated for 50 hours, but different formats, higher bit rates, higher volume, more audio enhancements, and other factors can effect battery life. Still, anything over 16 hours is gravy for me, as I rarely spend more than 16-18 hours awake - and if I wanted to, I could listen to the player every second of a 16-18 hour day and still be okay the next morning after I pop in another rechargeable AA. I am essentially using the G3 as an iPod shuffle, yet I get a whole host of extras when I need them, far and beyond what a shuffle can offer. An iPod would be the sleeker and easier to navigate choice, but the iAudio G3 is reasonably priced in its role as transitional link between something like the iPod shuffle and iPod nano. 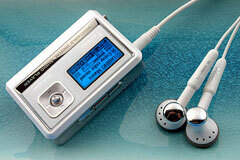 If one desires more nano than shuffle in their iPod alternative, I would suggest taking a look at the iAudio U3. The U3 is nearly everything I would want in a digital audio player, except that it lacks AAC support and an easily replaceable battery. The U3 has a built-in rechargeable unit which is tested to last about 20 hours, a color screen, photo support, movie playback, and the welcome addition of FLAC support. I'm guessing the silly folder/file limitation in earlier flash iAudio devices has also been rectified with the U3. The COWON eBay store has dropped the price of the White 1 GB U3 to $64.99 for the open box model and $69.99 for the new model. If I were to make my purchase decision this week instead of last, I would probably go for the open box 1 GB U3 instead. The additional feature set and the price being the same as the open box G3 makes for a great deal. It is worth noting that PayPal account holders can register their email before Dec 15 and make a qualifying purchase before Dec 31 to take advantage of the $20 rebate for any single purchase of $50 or more. It's worth reading the fine print, but eBay is listed as a qualifying merchant, and I expect my iAudio G3 purchase will qualify. Remember to register your email before making the purchase.